I may not have Irish heritage, but I undeniably love the color green. As a kid, when coloring or painting, I didn’t consider my work done until I added a splash of green somewhere. If you’re wondering, yes, I was a complete nerd who loved to draw, paint, build and decorate cardboard doll houses. I remember making a yellow-backed floral wall paper by drawing on white printer paper. It’s too bad I don’t have photos, because I’m sure it was just lovely-haha. To me, green adds a vibrancy and lively element no other colors can. Yes, yellow is bright and cheery, but it doesn’t add the right warmth. Blues are beautiful and soothing, but can’t quite make the statement green can. Green is so abundant in nature, whether light, fresh spring green, dark mid summer grass-green, or the muted tones found in fall and winter. As a general green lover, I’ve incorporated some of each throughout my home and I urge you to do the same. Some rooms have just a sprinkle (nothing too in your face) of green, such as our family room. In a mostly neutral space, nearly citron green pillows liven up the couch and add a jolt of color. A brightly colored green and blue landscape painting perks up the mantle while the lumbar pillows pull the color down to the neutral chairs. Just a few small green accessories like books, a small vase, and candles pepper the color around the rest of the room. Our kitchen counters are dark, nearly black green soapstone that still reads as a neutral. Small additions like towels, plants, dishes, even fruit are quick, zero commitment ways to add even more color. Other rooms have a slightly bigger swath of green, like our living room. Six sets of luscious grass-green velvet curtains flank the windows. Cover the curtains with your hand and you’ll notice just how much life and personality they bring to the room. When in doubt, always default to house plants to get that bit of color without overwhelming a room. Bonus, you don’t have to deal with picking paint colors or fabrics. Speaking of paint, sometimes a quart can make the biggest impact. At less than $20, what do you have to lose by giving it a try? Our main bathroom rocks an olive-green vanity, which has so much more character than any neutral ever will. Toss a few more green accessories, in this case, hand towels and a nearly ugly 70’s landscape painting, around the room to complete the look. 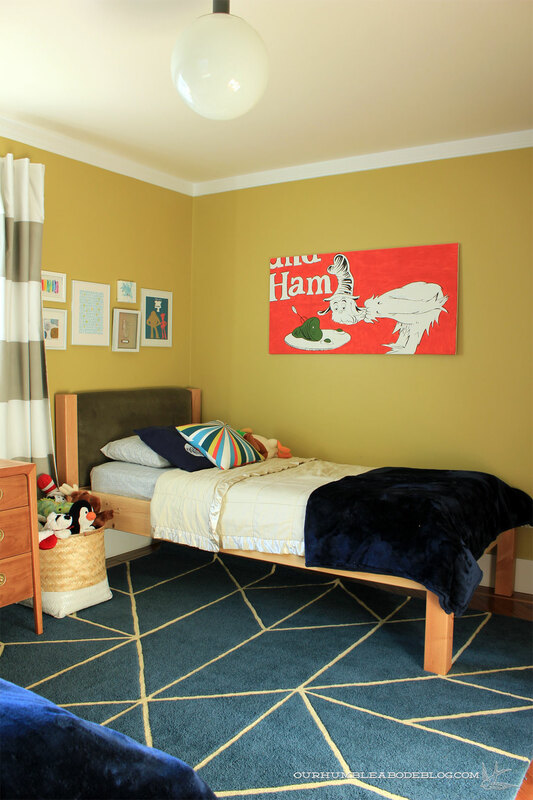 According to the color wheel, green is a cool color, but it certainly adds warmth to any space. A muddy sagey olive acts as an almost neutral backdrop in our guest bedroom. Pairing with bright white it feels so fresh, clean, and simple. But greens really shine next to warm wood tones, much like a tree trunk and leaves. By far the most overtly green room in the house is the boys’ bedroom. Back when I gave their room a makeover, I asked each of them what color walls they wanted. One said green and the other said yellow. We compromised with this lemongrass yellow-green. It’s fun and happy, but is tempered by white, gray, and navy. Our master suite, though mostly white and black, has green tucked here and there. 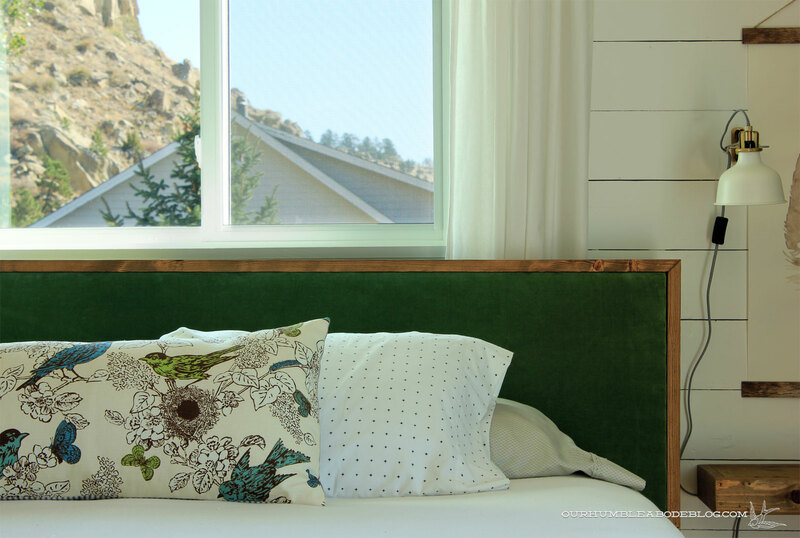 More grass-green velvet wraps the headboard for a touch of color against an otherwise white wall. Opposite the bed, a few bright green plants and (soon to be framed) landscape painting flank a dresser, bringing color around the room in a simple, easy-going way. Even our master bathroom has touches of green via plants and a very abstract landscape. Though we’re not quite at the point of the basement remodel to paint and add accessories, I’m trying to narrow down green paint options to use down there in a few ways. I think we all have a color we naturally gravitate toward, right? What’s yours, and more importantly, how do you use it in your decor? When you’re on a budget and have something specific in mind, DIY is such a good option, allowing customization and a lower price point than most store options. That’s how our king sized bed came to be, and cost less than $200 for every last supply. 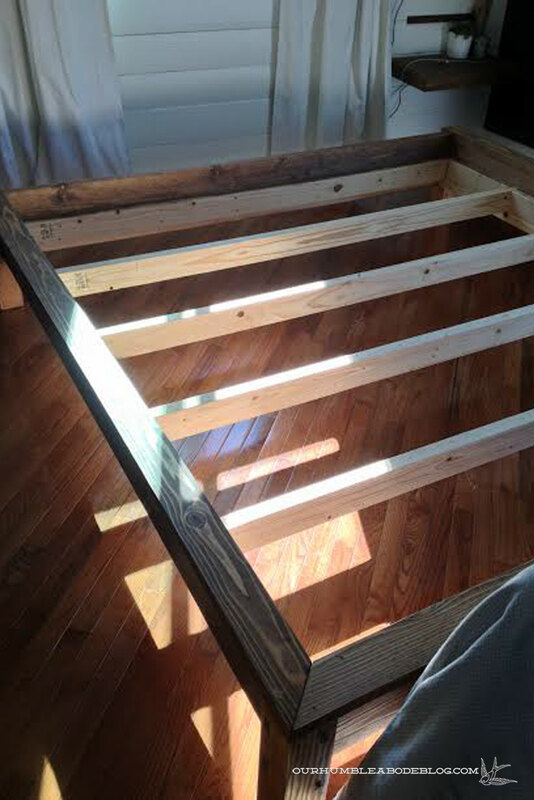 Fortunately, this wasn’t our first bed building experience-we made a captains bed for our smaller bedroom at our last house and a bed for each of the boys about two years ago. 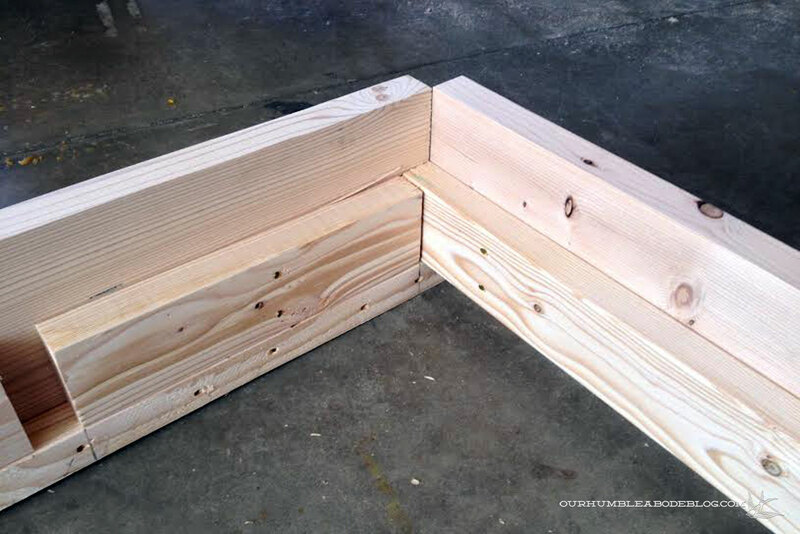 In fact, the process for creating our bed was very similar to the steps we used to make a set of twin beds. 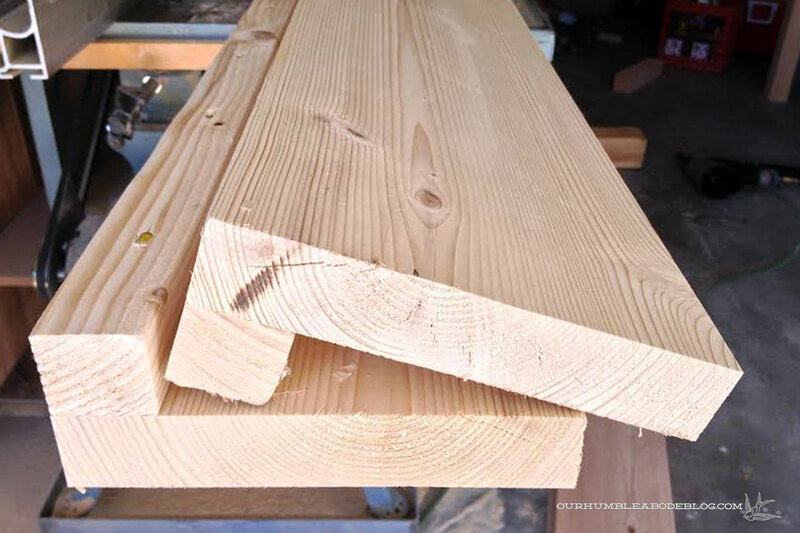 First, we cut a 4 by 4 post into 16 inch lengths, then running the sides through the table saw to create a 3 1/4 inch square, just to take the rounded edges off, looking less like dimensional lumber. 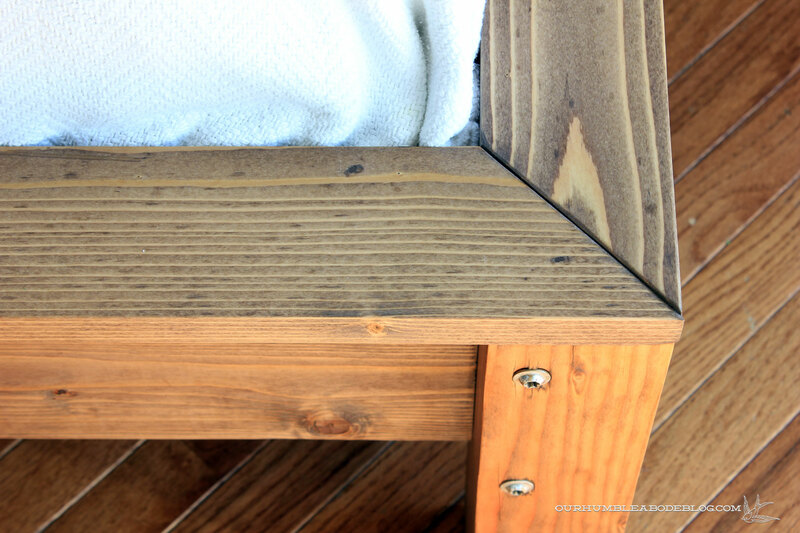 With a sander, I angled the tops of each post an eighth of an inch, just to ease the seam. Here’s a normal post next to a finished one for comparison. 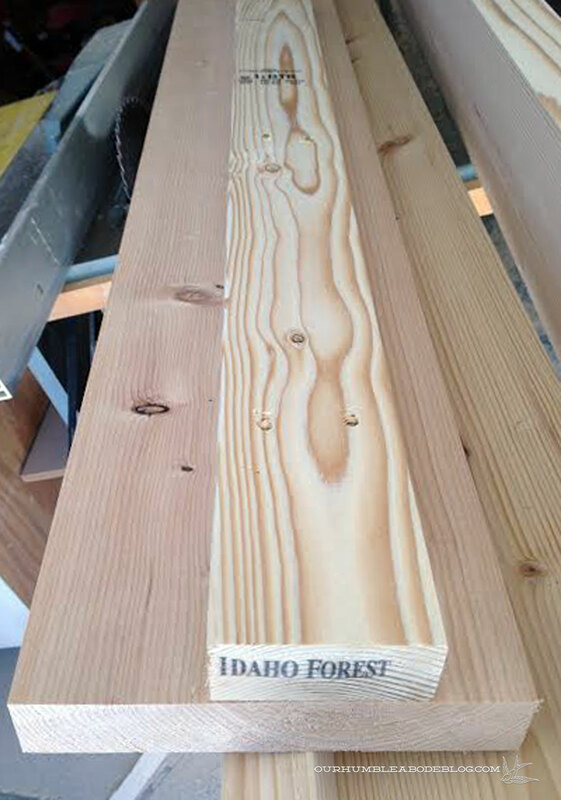 To securely fasten the side rails into the posts, we measured 1 1/2 inches and 6 1/2 inches down from the top of the post. For the head and foot rails, we measured 2 inches and 6 inches down. Staggering the screws is a very important step because the screws are going in perpendicular and you don’t want them to hit. 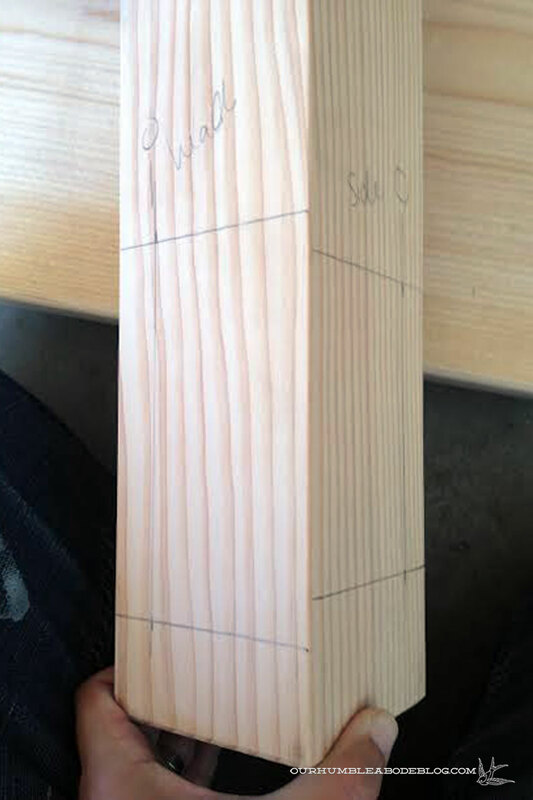 It’s easiest to place the post in the corner and mark 3/4 of an inch in from the edge where the rail will go in. Pre drill holes through the post, keeping the drill as plumb as possible to avoid the screws going in wonky. 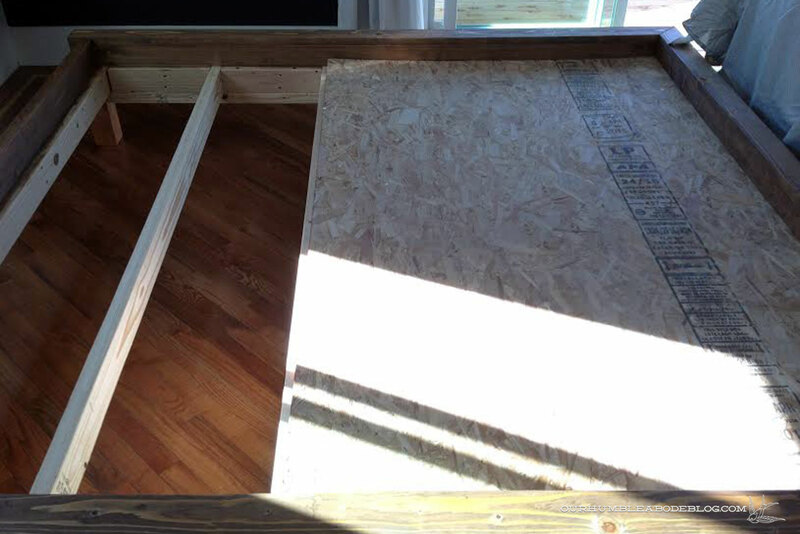 For a beefier, well proportioned bed we used 2 by 10 boards for the rails, with a half strip of 2 by 4 nailed along the base. Again, we ran each through the table saw to cut away the rounded corner. 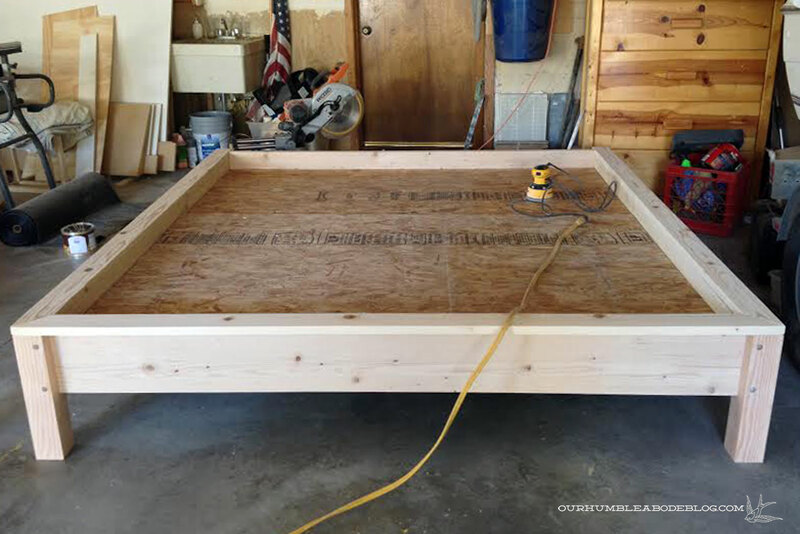 Large beds are difficult to maneuver, getting around corners and through doors, so we built each side to come apart easily. For even easier disassembly/moving, Ben attached spacers to the side rails, leaving enough room for a vertical 2 by 4 between each. These keep the mattress cross supports in place without nails, meaning the supports are removable without tools! Along the head and foot rails, we secured a 2 by 4, to give the OSB a ledge to rest on, keeping it flush with rest of the cross supports. Below, the rails are ready for the corner posts. 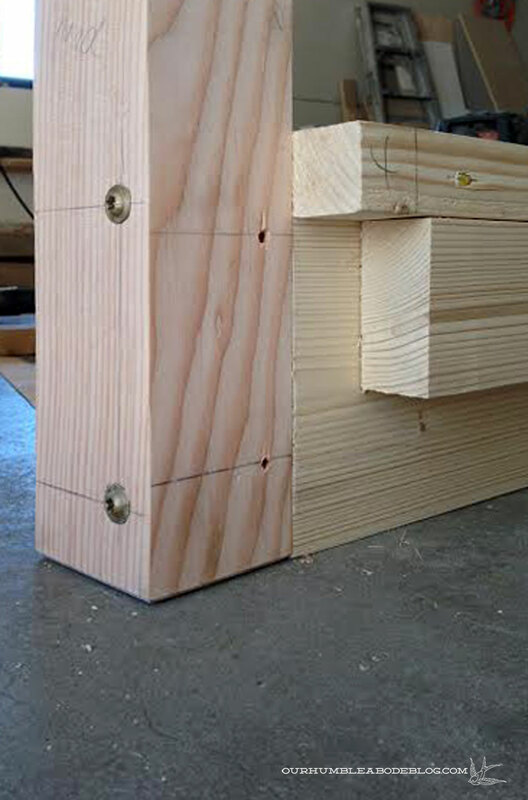 On a level surface, lay all the pieces out upside down, which keeps the tops of the rails and posts flush. Then drive a 6 inch long screw through the post and into each rail. 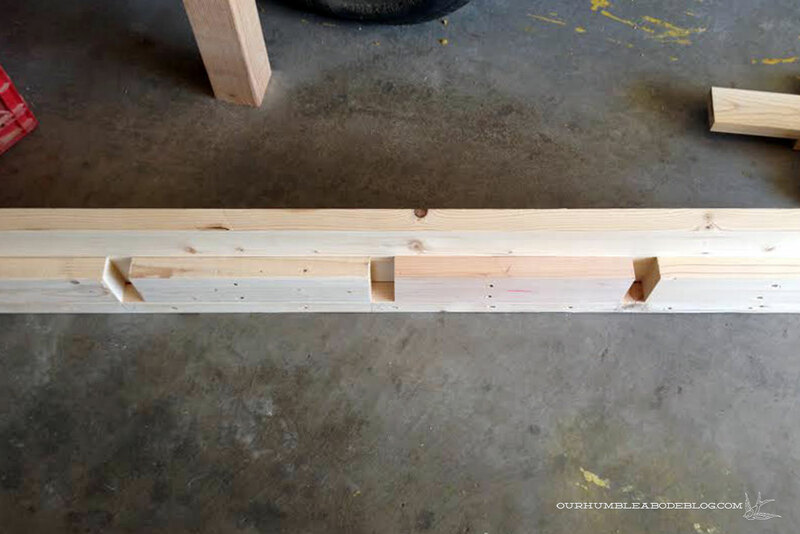 While still in the garage, we assembled the bed to make sure everything fit, then took the side rails apart, leaving the legs attached to the head and foot sections before staining. 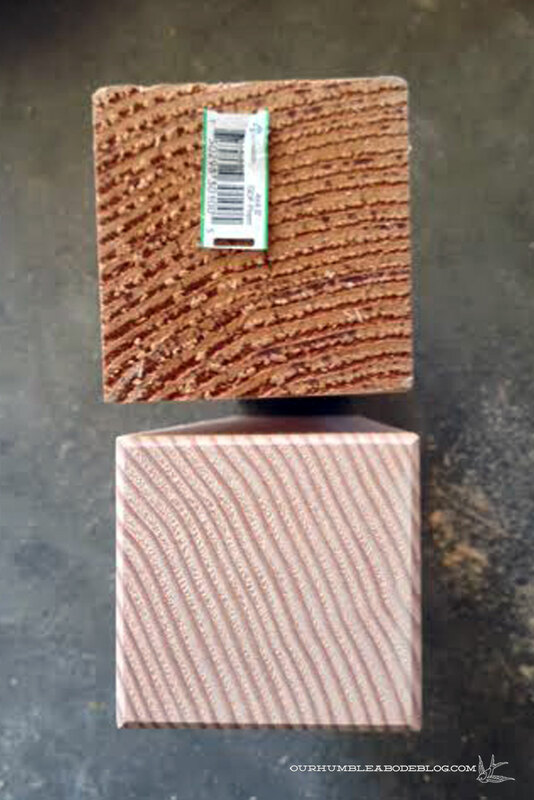 Our finishing cap that covers the posts and rails is also a 2 by 4, but planed down to a 1 inch thickness and cut to match the post width of 3 1/4 inches. 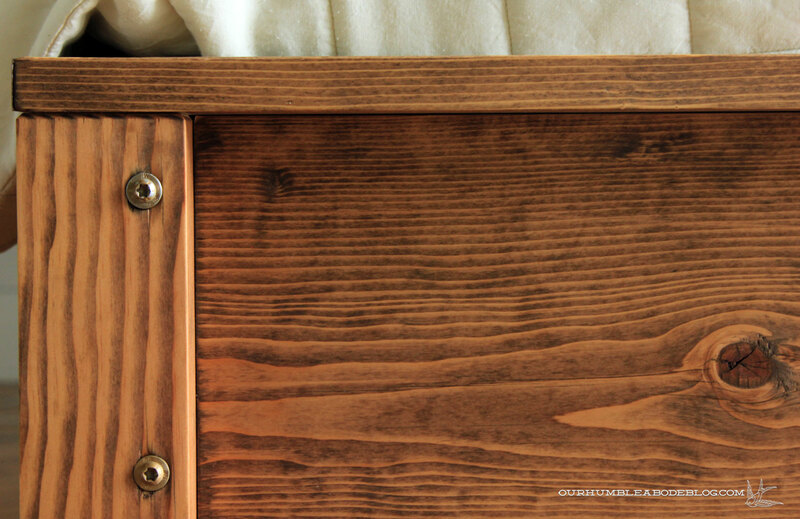 Mitered corners on the foot end, but a square-cut at the head end to tuck under the headboard. Once stained, oiled, and dry, we hauled the pieces up and put it back together, just like Humpty Dumpty. In go the cross supports, spaced 16 inches on center. Ben builds everything to allow a large pachyderm to be able to use it, so no creaking, squeaking, or wobble going on here. 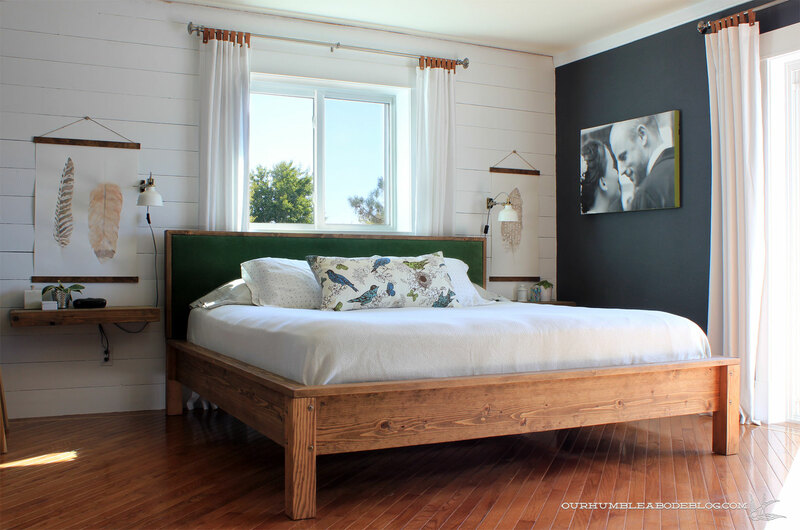 The headboard is a sheet of OSB cut two inches narrower than the frame, then the edges are thickened up with a half strip of 2 by 4. I wrapped batting, then the velvet over, stapling to the underside of the 2 by 4 edge. Once the upholstery was done, we nailed a 1 inch wide wood strip around the sides to finish it off. 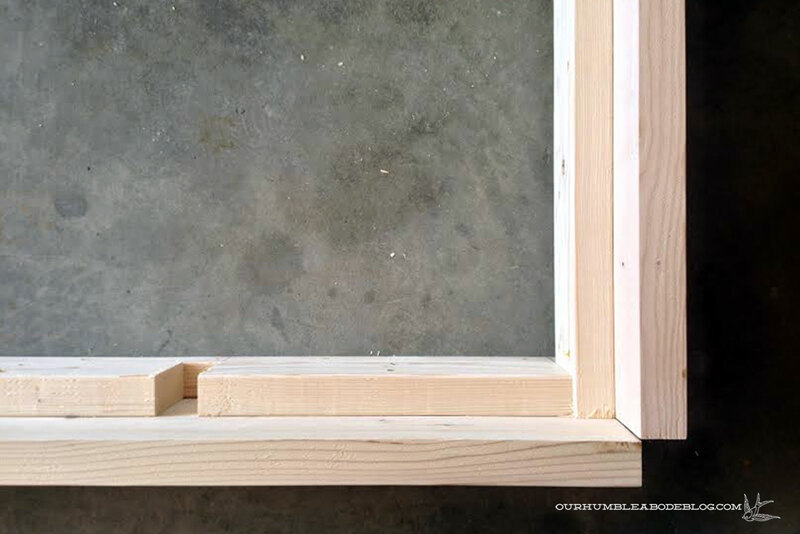 Two by six sections run vertically, screwing into the back side of the head rail to attach the headboard. Overall, the bed took us about 6 or 8 hours to build and finish from scratch. And in those hours, we saved roughly 1600 dollars, which is far more than my hourly pay rate of nothing.